Dr. M.Mukunda obtained his MBBS from the Government Medical College, Trivandrum, India. Following this, he obtained his MD (Internal Medicine) from the renowned Hospital, Dr. Ram Manohar Lohia University of Delhi, India in 2004. In 2005 he obtained his DNB in Internal medicine. He did his Super specialty training in Gastroenterology from 2006-09 from Government Medical College, Trivandrum. Following the completion of his training he joined as faculty in the Department of Gastroenterology, Medical College, Trivandrum and worked in the capacity of Assistant Professor till 2012.Then he got transferred to Medical College Kottayam and was working in the capacity of Assistant Professor till December 2013. During his tenure as Assistant Professor in Medical College Trivandrum , he was incharge of the motility lab and was the main person handling High Resolution oesophageal manometry. During his tenure in medical college he was involved in assisting the head of the Department in the training of Gastroenterology DM trainees. 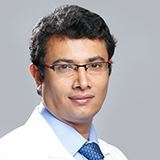 He has 10 years of experience in the field of medical gastroenterology, therapeutic endoscopy and hepatology. In 2014 January, he moved to Holy Cross hospital, a tertiary care hospital with a good gatroenterology setup for advanced procedures where he got trained in advanced therapeutic endoscopy, Endoscopic Retrograde Cholangio-pancreatography (ERCP) and Endosonography (EUS). The center boasts of an annual volume of upto 360 ERCPs and close to 120 EUS. He worked there till October 2016 (close to 3 years). Dr. Mukunda joined NMC Specialty Hospital, Al Ain on 1st November 2016 as specialist gastroenterologist. His areas of interest include therapeutic endoscopy and hepatobiliary interventions (ERCP) . He regularly participates in national and international conferences to keep himself abreast of the latest advances in his field. Dr. Mukunda is fluent in English, Malayalam, Hindi and has working knowledge of Punjabi.